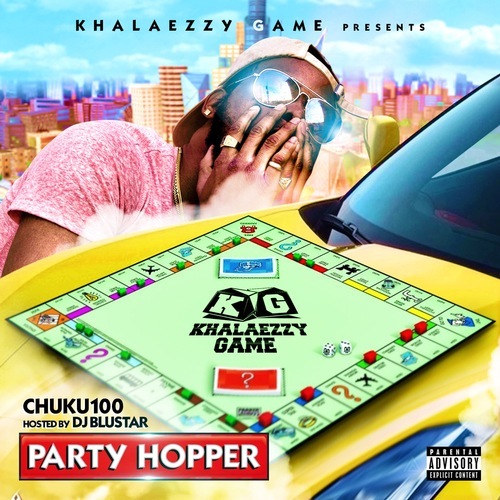 Chuku100 repping that "KhalaezzyGame" to the fullest, is back with his much talked about and in my opinion solo branded project titled "Party Hopper", Hosted by DJ Bluestar. I don't really know what a "Party Hopper" is now days but i'm a big fan of artist putting effort in artwork along with telling a story, I appreciate this, and i'm sure his supporters and gained fans with the DMV were attracted to it. Listening to the into I asaw where he was going with this project, hype, hyped up and giving the supporters a fly fun vibe, its all about the party and now days with the youth thats what its all about and he instantly explains who he is as am artist and what he thinks of the culture with speaking on his swag in the track "Who I Am" and that's always necessary coming from the DMV thats our thing. The record seems very party like of course just like the title. When I review any tape I look for the change in records, I think the sound changed once we hit track 4 featuring "Top Shotta Fi" titled "My Life". The track was somewhat personal with a great feature verse thats always important, most underground artist can mess a good song up with a feature but not this time, I think it was very fitting for the tape! Other than a "Maulie Mal" feature "Top Shotta Fi" is the only other artist featured on this project, that allowed Chuku100 to shine and provide us with all of him, that is very important most artist tend to lean on featuring to hold them down on tapes. "Summarize" and "Bout Dat Time" get mid into the project and its still more fun and possible club bangers left. Chuku100 rides the beat in his on way, and provides a quotable hook most times from himself, that could become an issue, but it seems to work for him and his style, so you cant knock it or can you ? That's for the listener to decide. I personally think it doesn't hurt his style or making music. The song that I was looking for this whole time is also featured by "Top Shotta Fi" titled "No Degree". My reason is simple I needed something to ride to with a purpose and message along with a change of vibe with replay value. Reply value is very important a project should always have a track that you want to hear over and over, if it doesn't its an issue, but we are safe. I like the flow and also the production sounds so clean. Still successful in his own right with no degree, rap is the hustle he went with and he is sticking to it, that's exactly what I got from my favorite track on this project!